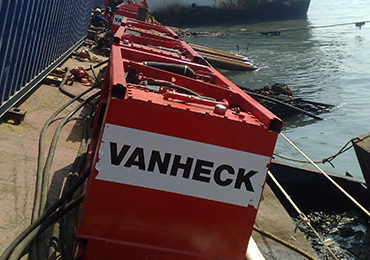 You are most likely to find Van Heck’s hydraulically powered pumps in the offshore and salvage industries. Reliable systems for delicate operations. The robust construction and salt water resistance are the most valuable features of these compact pumps. Widely applicable submersible pumps for load-outs, float-overs, decommissioning and salvage operations. Ideal as feed pumps for high pressure pumps for cable laying and pigging. Three different models with a broad selection of pressures and flow rates. The pump is placed in a vertical riser pipe, making it easy to install. Powerfully driven by Van Heck’s hydraulic diesel power packs.